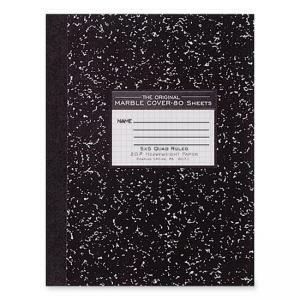 Media Size: 10.13" x 7.88"
Composition book contains 80 sheets of 15 lb., 5 x 5 quad ruled paper. Ideal for school lab reports and note taking. Design features a center-sewn hard cover. $5Pacon Art1st Sketch Diary - 9" x 6"
$9Rediform Blueline Notebook - 7.25" x 9.25"
$25Tops Double Docket Writing Pad - Letter 8.50" x 11"